About 25 miles south of San Francisco is the picturesque seaside village of Half Moon Bay. While visiting this area with endless beaches and photo opportunities, you’ll hear the term “Coastside” used frequently. It refers to the San Mateo County Coastside, which is made up of more than 300 square miles of breathtaking California countryside. 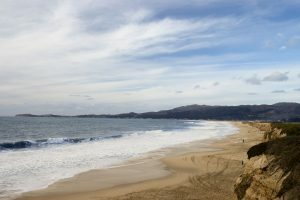 The Coastside offers easy access to sandy beaches, redwood forests, and open spaces, and encompasses the cities of Half Moon Bay, Montara, Moss Beach, El Granada, San Gregorio, La Honda, and Pescadero. Set in the heart of the Coastside is Pelican Point RV Park, which is a short walk to the Pacific Ocean in one direction and the town of Half Moon Bay in the other. Featuring 75 sites, this is one of the best RV parks in the area. A pet-friendly resort, Pelican Point also offers full hook ups, free Wi-Fi, cable TV, a dump station, convenience store, restrooms, and showers. The Coastal Trail begins right outside the park, and is popular for bicycling, walking, or getting to the beach. 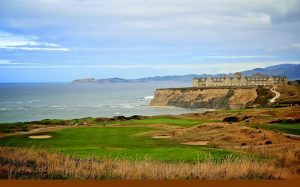 For golfers, accessing the nearby Half Moon Bay Golf Links is a must. Though pricey, it is well worth the money to experience golf with a backdrop of incredible scenery. 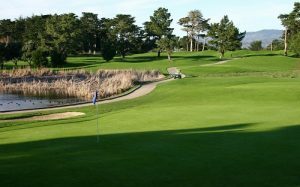 With 180-degree sweeping ocean views, Half Moon Bay Golf Links features two breathtaking courses: the firm and fast links style of the Ocean Course, and the American traditional parkland style of the Old Course, with its iconic cypress trees and dogleg fairways. The par 72, 7,001-yard Old Course was designed in 1973 by Arnold Palmer and Francis Duane, and later re-worked by Arthur Hills in 1990. The counterpart Ocean Course was also designed by Arthur Hills, opening for play in 1997. The par 72, 18-hole championship Ocean Course stretches to 6,854-yards. Half Moon Bay Golf Links is also part of the castle-like Ritz-Carlton hotel and spa. Like the golf, they have great food and amenities, but it comes with a price. You can find more details about Coastside California on VisitHalfMoonBay.org. To read more about Pelican Point RV Park, see what other RVers said on Campground Reviews. Pillar Point north of half moon bay has been greater for us than Pelican point, south of town. Very different places. Pillar is informal, more friendly, right at the water. Yes its lacking in amenities but better priced and has excellent folks staying there every year we go. We stayed at Pillar Point as well and found it to be one of the tightest parks, anywhere. In fact, ended up in the parking lot with every site being already full and, where we probably had a little more room. The orange cones you see, abound and they must own more than the DOT, but it was all good for a night and before making our trek north, through the traffic of SF. Read the reviews. The manager at this park is quite famous for being ‘difficult’. Small spaces. Noisy. Go 20 minutes south and try the North Santa Cruz KOA in Pescadero. Big park. Actually has grass and horses and nice people.